Tailor safety to the project. Safety practices should be covered daily with specific information for each project. Discourage unsafe work practices. Stop them as soon as you see them. Lead by example. Work as safely as possible so others will follow your lead. Keep a clean and organized site. This will offer fewer hazards and allow the site to be more productive. Identify and avoid site danger areas. Dangerous power lines, unsafe roof access areas and underground hazards such as cesspools and power lines should be avoided. Inspect ladders before use. Make sure the rungs are not broken or cracked and clean off any oils, tars, or dirt. The ladder must be tied off. Do not leave ladders unattended. Take them off the job site every day or lock them on the ground overnight. Climb ladders safely. Always face the ladder and use both hands when possible. Don’t slide down a ladder or overload them. Be wary of electrical wiring. Electricity can “jump” from a wire to a ladder several feet away. Keep your distance from electrical wiring or boxes and remember that metal flashing, drip edge, etc., should never touch electrical wires. Use tools properly. Wear eye protection when using hammers and nail guns. This will help protect you if an object such as a nail comes flying out. Always cut away from your body when using a utility knife and replace dull blades frequently. 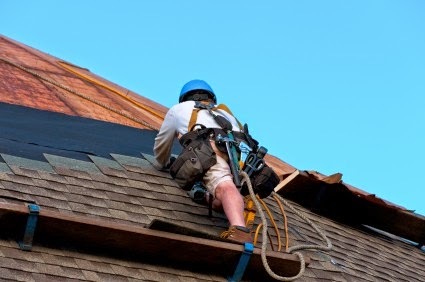 By following best safety practices on all your roofing jobs you can make sure accidents are few and far between.